One participant – Charles Wade – admitted during the segment that he had traveled to the embattled Missouri town at the center of the Brown case. In a Friday Twitter post , he thanked the CBS journalist, Lauren A. White , and "all the folks who worked with her to pull together such a diverse panel." White actually used her own Twitter account  earlier in December 2014 to reach out to Wade  and other activists  who are championing the Brown family's cause. Two other panelists – Ijeoma Oluo  and Gani Afolabi  – both identify themselves as "feminists" on their Twitter profiles. White certainly assembled a racially-diverse panel, but shut out diversity of thought. ELAINE QUIJANO: How many of you have been involved with the protests that have taken place in the wake of Ferguson? 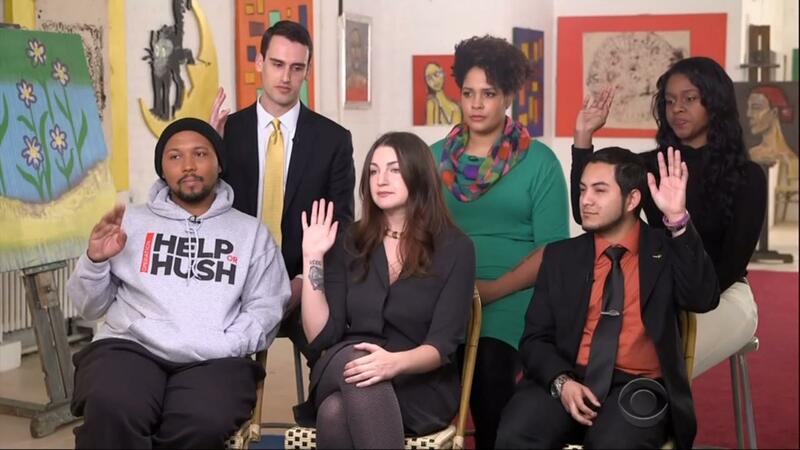 (all six panelists raise their hand or nod their head) Everybody here. Why? GANI AFOLABI: I can't manipulate policy right now. I can't ask the President to do something today. All I have is my body. All I can do is go somewhere and show support. But that's all I can do right now. QUIJANO: What is the change you're trying to achieve? CHARLES WADE: You know, everyone says justice – like, we want justice. But everyone has a different idea of that. So, for some people, justice is a legal victory. That's not justice for me. To me, justice is equality and accountability. QUIJANO: Do you think – when it comes to race relations in this country, have we reached a tipping point? WADE: Because we move to healing so quickly. Like, people are already like – you know, after Ferguson – and I'm in Ferguson like, 'After Ferguson? Are you kidding me?' How – how are we after Ferguson, when you have – when – when the very thing that got us here has happened two more times in three months? AFOLABI: But I think it's also important to – like, note that we don't have it perfect at all yet. And there are a lot of people in our generation that need to check their own privilege, and understand their own biases as well. ELAINE QUIJANO: What is – let's unpack this term 'privilege' – okay? When you talk about white privilege, what are you talking about? GANI AFOLABI: It's when you're afforded opportunity, because the status of our country was based on your norm. What's normal for you has to be normal for me. And if I want something different, then I'm pulling the race card. JOHN REYNOLDS: So, it's not about silver spoons. It's not necessarily about that. It's about the fact that I do not have to multitask every second of every day worrying about how people are perceiving me as a white person. I – when I go into a store, as I'm leaving, I don't have to think, 'Did I do anything that's going to make them think I stole something?' And so, that's a privilege – the fact that I don't have to carry all this stuff with me every second of every day. IJEOMA OLUO: There's such a wall around whiteness, where you can go through your whole day without ever having to address the things that black people are literally pushing through – just to get through their day. And make people uncomfortable – bring it in, bring it up – because the more that you can do that, the more empathy is built; the more people will actually believe us when we say these things are happening. The journalist ended the segment by noting that "many in the group also said they feel disconnected from some of the civil rights leaders of previous generations. So instead, they rely on social media to mobilize themselves. But they also acknowledge sometimes being leaderless...can make it difficult to get real results." Anchor Scott Pelley complimented Quijano for the "insightful interview" before moving on to the next report.